Commonly called Wild Ginger, Asarum canadense is not generally used in culinary as it was by the early Americans did for a ginger substitute. A wildflower native to the northern and eastern parts of the United States. Grows in well drained to wet soils that are in part to full shade. Small cup shaped purple flowers pop up in spring just above the kidney shaped leaves. Plant in woodland areas, native gardens, for naturalizing or edging shaded areas. Spreads by rhizomes to eventually form ground cover in shaded areas. 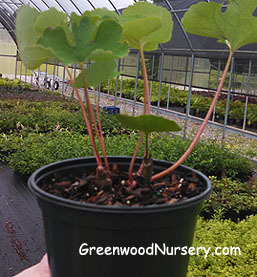 Asarum canadense Native Wild Ginger is grown in one gallon containers. Plants shipping to AZ and CA addresses will be bare rooted and root washed before being prepped for shipping.